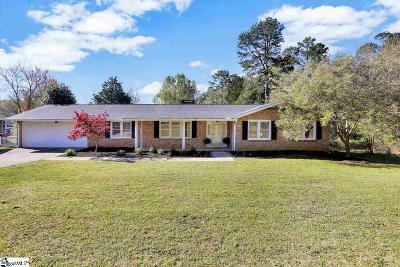 Welcome home to this one level brick ranch with lots of updates including fresh paint and new flooring/carpet. Upon entry, you&apos;ll find a a formal living area or office space that opens to the dining room and a den with wood burning fireplace and built in bookshelves with desk. The eat in kitchen has plenty of cabinets, a gas range, and tile flooring. You will enjoy the separate laundry/mudroom off the garage with a convienent built in ironing board. The hallway leads to an updated bathroom with a tile tub surround and spacious vanity and 3 large bedrooms. One of the best features of this home is the peaceful, fenced backyard on over half and acre with privacy. The left side of the property borders a privately owned tree farm preserved for the study of the Eastern Box turtle. Enjoy entertaining family and friends on the large covered porch. New roof and HVAC system in the last 5 years. Conveniently located to I 85, ICAR, and Downtown Greenville, this home has no HOA fees and the option to join the community pool with swim team. Visit today!